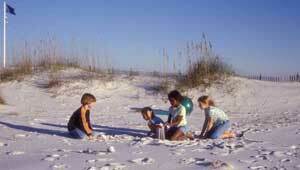 The beaches on the Florida Panhandle are often ranked among the world's best. Hundreds of thousands of visitors flock to the area's white-sand shores and emerald-green waters every year. Many people decide to stay, making South Walton, at the very center of the Gulf Coast panhandle, one of the most rapidly developing coasts in the nation. In 2003, TPL helped protect nearly 3 acres of beachfront as an addition to the Stallworth Lake Preserve, a popular destination on the beaches of South Walton County. This property also serves as a buffer for the fragile coastal dune lake ecosystem. The property will be managed by the U.S. Fish & Wildlife Service and was made possible with funds from the USFWS Habitat Conservation Plan Land Acquisition Grant Program and from Walton County.